A science story is rarely unrelated to anything else; segregating science by removing it from the rest of the news gives the impression that science is not relevant to the rest of life. It also means that people can easily see the theme of the page and turn over without engaging with any of the items on it. Instead, science should be included in the news without necessarily being heralded as ‘science’. This does not mean that science journals and magazines should be discontinued but in general interest publications, science should be discussed alongside politics, animal welfare and partying celebrities. A single story about a government minister, a pop star’s puppy and science would be just perfect! 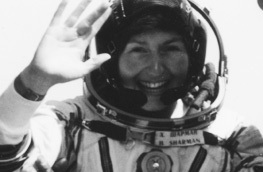 Helen Sharman became the first Brit in space in 1991. She is now Operations Manager at the Department for Chemistry, Imperial College London.